Sastra University BTech Admission 2018 process has started from 25 March with the availability of the online and offline application form. 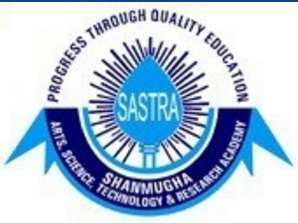 Sastra University offers B. Tech, 5 Year Integrated M. Tech, M. Tech, / M.Sc., Programmes, MBA, B.Com, CA, B Sc., B. Ed, & BA, B. Ed, B.A. LL.B, B.Com LL.B - (5-Year integrated), MCA Programmes. Here the candidates can get full information on admission process for B. Tech and 5 Year Integrated M. Tech program. The candidates can submit the online/offline application form for Sastra University BTech Admission in 5 Year Integrated M. Tech program until 9 June 2018. The candidates will be admitted on the basis of the given below streams. Age Criteria: The candidates should be less than 19 years (21 years for Lateral Entry) on 1 July 2018. Eligibility for STREAM 1: The candidates who are passed in Class 12 or equivalent exam with Mathematics & Physics as compulsory subjects from a recognised State Board or Central Board with a minimum aggregate of 60% marks are eligible to apply. The candidates should also have appeared in the JEE Main 2018 Examination. The weightage for the JEE Main Exam and the Class 12 Marks will be 25% and 75% respectively. Eligibility for STREAM 2: The candidates who are passed in +2 or equivalent exam with Mathematics & Physics as compulsory subjects from a recognised State Board or Central Board with a minimum aggregate of 60% marks in Mathematics, Physics and Chemistry / Biotechnology / Computer Science / Biology are eligible to apply. Eligibility for Lateral Entry: The candidates who have completed diploma in Engineering / Technology are eligible to apply for direct admission in the 2nd year of B. Tech/M. Tech (5-Year integrated) program. The eligible candidates can apply for admission into B. Tech/M. Tech (5-Year integrated) Programmes at Sastra University through both mode online and offline. The online and offline application form are available on the official website of Sastra University at www.sastra.edu. The candidates can also click the link given here for online/offline application form. STEP 1: The candidates have to first download the application form here or also on the official website of the University. Now the candidates have to fill the application form by providing basic personal details, educational details, qualifying exam details, contact and address details. The candidates also have to paste the required passport size colour photographs at space given in the application form. STEP 2: Fee Payment: Now the candidates have to make payment of the application fee of Rs.650 through bank demand draft (DD) which should be in favour of "Sastra" and payable at Thanjavur. STEP 4: Once the filled application form along with application fee DD submitted, the candidates will be intimated of the application number through e-mail. The candidates will also receive a copy of the brochure. STEP 1: The candidates wish to fill the application form through online mode can click the link given here and can also visit the official website. To fill the online application form, the candidates have to first register themselves by providing some basic details such as name, email address, mobile number, course applying for, age etc. STEP 2: Now the candidates can fill the application form by providing the details asked in the application form. The candidates also have to upload the scanned copy of their latest colour photograph and signature. STEP 3: Now the candidates have to make payment of the application fee using online mode of making payment. The candidates can pay using a credit card, debit card or internet banking. The candidates have to pay the fee of Rs. 650 for the Sastra University Admission 2018 application form. There will be a common application form for both the STREAM 1 and STREAM 2. The Fee can be paid via Demand Draft/Credit Card/Debit Card/Net Banking. The candidates will be selected for admission into B. Tech. / 5-year Integrated M. Tech. programmes under two streams. The candidates will be selected under stream 1 (70% seats) on the basis of their JEE Main 2018 scores and +2 marks and the weightage of their JEE Main scores and +2 marks should be 25% & 75% respectively. The candidates can get admission under stream 2 (30% seats) on the basis of their performance in their +2 examination. A merit list of normalised percentage for making admissions will be released by the Sastra University. The candidates selected for counselling under stream 1 or stream 2 will have to available at the counselling centre on the date given in the admission schedule. The counselling process for Stream 1 and stream 2 will be held from 21-24 June 2018. The allotment of seats will be based on the merit of students followed by the normalisation of marks in Stream 1. The counselling process will be conducted at the Sastra Campus on a giant screen to ensure transparency of the admissions. Note- The candidates who are admitted under stream 1 will be allowed to attend counselling process for stream 2 if they wish to. Stream 1 and stream 2 will be merged after 2 round of counselling based on vacant seats. Phone: Phone +91 4362 264101- 108, 304000-010.